When it comes to parties for tweens, sleepovers are a big hit. Both girls and boys alike enjoy gathering their friends for a sleepless night of fun, games, and even some pranks. More than likely they will be patiently waiting for the first person to fall asleep so the pranks can begin. This all sounds like fun, but how do you choose the pranks that are safe and fun for everyone to enjoy? 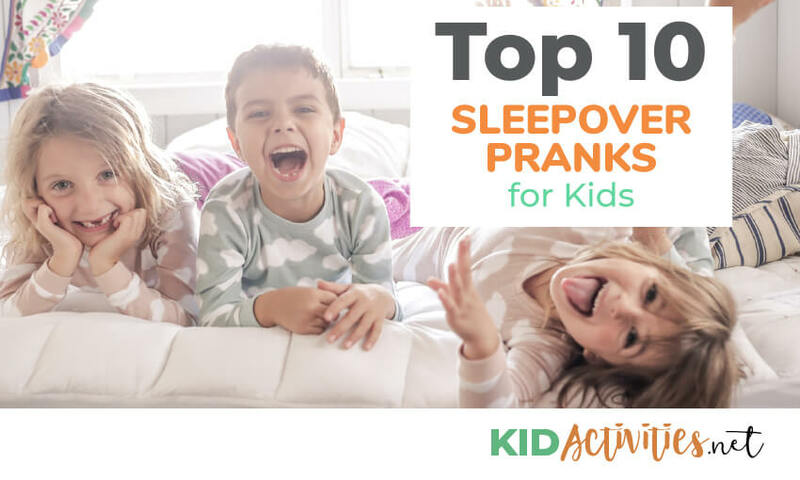 The following is a list of top 10 sleepover pranks to help get things started. These pranks are safe and easy, and most can be done with things you already have in the house. We have also included 3 additional pranks that you can purchase from Amazon to incorporate into the night for even more fun. You’ve heard about the bucket over the door filled with water prank but that one can be a bit messy, so instead, fill a bucket with confetti and plant it above the door. Just in case you’re not familiar with this prank, once the bucket is full you can connect it to the top of the door using string so that when the door closes, the confetti will fall onto the head of the victim. This is a good one to pull in the bathroom since the door is guaranteed to be closed. This prank is sure to annoy even the most even-spirited guest in the house. Before bedtime, sneak as many phones as you can and set the alarms for all different times throughout the night. If you have other alarm clocks throughout the house, be sure and set them as well. After everyone is asleep the alarms will go off one at a time. Set them about twenty-minutes apart or with enough time in between that everyone will have time to fall asleep again before the next alarm goes off. Don’t be surprised if you have one heavy sleeper in the bunch who never hears the alarms. You can save another prank to get even with that person later. Set up the movie and turn out the lights, because no scary movie can be fun with the lights on. Once everyone is snug, go out of the room as though you’re going to the bathroom. Sneak out the door and go outside to the nearest window facing the movie room. Be sure and get permission before going outside in the dark. Just as everyone is in deep concentration of the movie, knock on the window and hide. While everyone is hiding their eyes or running to the window to look out, you can sneak back into the house and act as though you have no idea what is going on. If it’s not possible to go outside, or there is no window to access, you can wait until the room is quiet and let out a scream. You’re guaranteed to make everyone else scream too. Let’s face it, the only reason people eat an Oreo is to get to the cream in the center, so wouldn’t it be a disappointment to tear one open and find that it isn’t cream in the middle, but toothpaste instead? That’s right, this one will take a bit of time but it sure will be fun to watch your friend’s facial expression when they find out that you replaced all the cream with toothpaste. Be sure and save a few with cream for yourself so that your friends don’t suspect the prank that waits. When the first person goes to sleep, fill their shoes with tissue, cotton balls, or even some M&M’s. Make sure that you stuff the shoes at the toes, so they won’t see it before they put them on. Whatever you do though, don’t make it messy because you wouldn’t want to ruin their shoes. Remember, it’s all meant for fun. This prank will probably work best with shoes that can be slipped on so that they won’t pick them up to put them on. When two people are asleep next to each other, tie their ankles together using a piece of their clothing that they’re not wearing. A good example would be a pair of socks, a long tee shirt, or a hair band. To make this prank even more fun, consider tying their wrists and their ankles together. Use caution though so that you don’t wake either of them up while tying them together. There’s nothing like loud noise to wake someone from a sound sleep! Once most of the guests are asleep, collect some balloons from the party or blow some up for this prank. You will need something sharp to start popping the inflated balloons. Continue popping them until everyone is awake or all the balloons have been popped. The more you pop the better the prank so keep that in mind when you are decorating for the party. When two or more guests are asleep, dump their clothes from their bags into a pile and mix them up. Once all the clothes are mixed up put them back into the bags. When they wake up to get dressed, they will be confused when they find someone else’s clothes in their bags. Hopefully, they will find the humor in this prank and they won’t stay mad at you for long. Before the party, find a creepy mask or a scary looking doll. When the first person falls asleep, put the mask or the doll on a pillow next to them and place it so that it’s staring in their eyes. When they wake up this will be the first thing they see and it’s sure to scare their socks off! Imagine the surprise on your friend’s face when they squirt toothpaste and out comes a raisin. This is a fun and easy prank you should try on the first person who falls asleep. Simply put a raisin inside the toothpaste tube and the next morning when they brush their teeth they will be startled when the raisin pops out. Of course, they will come out of the bathroom hunting for the culprit, but if you act innocent, they will never know it was you. These twelve roaches are so realistic that you could put them in your friend’s sleeping bag for the perfect prank. You could use them as a shoe filler or even in the clothes mix-up. For even more fun, you can strategically place them on the food table or in the punch bowl. They are made of a rubbery texture and look so real that it will take a minute to convince your friend’s that it’s only a prank. These are the perfect addition to your list of sleepover pranks. This scary window peeper could be used for the scary movie prank if you’re not able to do it yourself. You could even incorporate this into a different time throughout the night. No matter when you use it, the creepy man with the beady eyes and smirky smile will be sure to scare everyone who is in the room. It’s a window cling so it can be used over and over again, and it won’t damage the surface. If you’re not sure what pranks you want to do or if you want the pranks to last all night, then this ultimate prank kit is just what you need. From itching powder to a whoopee cushion, this kit features all the best pranks you will need for the night. Sprinkle some itching powder in your friend’s sleeping bag or set the trap on their seat with a whoopee cushion. You can pretend like you cut yourself with blood capsules or put a nail through your finger. There is so much to offer here, and the best thing is that you can use some of the things in this kit again for the next party! 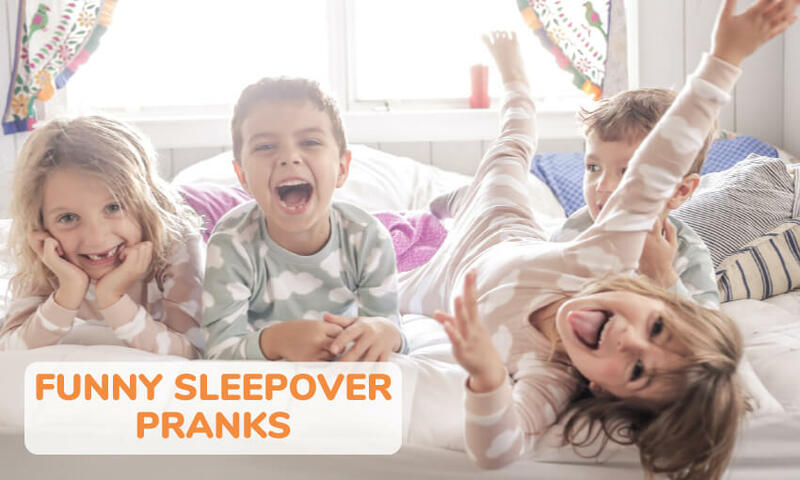 Now that you have this list of the top 10 sleepover pranks, you’re well on your way to a fun party! 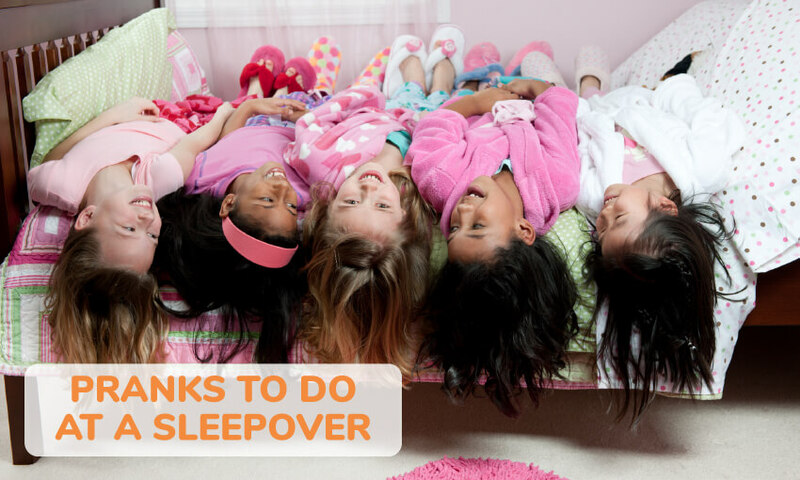 When planning the sleepover, you will want to choose some great snacks and plan some other games too so that nobody ever goes hungry or gets bored. Just remember to stay safe and never do anything that will cause harm or damage to anyone or anything. While pranks can be fun, they can also be dangerous if not done correctly.